NFL Reward Charts! 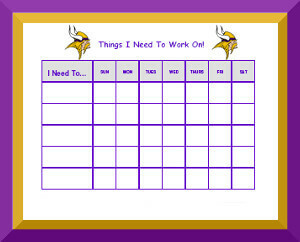 You'll find your favorite football team with our printable NFL behavior charts. Your child can track chores, daily routines or behaviors while feeling motivated by her favorite team! You can use the "comments" space to list rewards earned or comment on how the week went. Don't forget to also check out our Sports Theme Behavior Charts, NBA Behavior Charts and Baseball Behavior Charts.